"[I]t is an impossible book to put down, a psychological thriller that will haunt you long after the final page has been turned." "A stunning exploration of social isolation... Masterfully plotted." "Fossum . . . writes like Ruth Rendell with the gloves off." "This is not your usual police procedural -- Fossum's third Sejer novel ... is psyhcological suspense at its best." "[T]he story is so chillingly told that we can only marvel at the author's skill at illustrating how a random sequence of events can cause so many lives to intersect in so many horrifying ways." 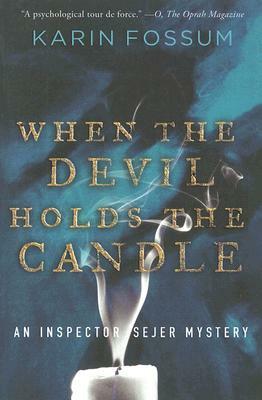 "Either somebody just slid an ice cube down your back or you're reading the opening pages of When the Devil Holds the Candle...a psychological tour de force." "Skillful characterization and revealing detail lift Fossum's third mystery to be published in the U.S featuring thoughtful and intelligent Insp. Konrad Sejer."